The Chrysler Pacifica Hybrid is my new favorite minivan! And, by the way I really love minivans. There is just no better fit for someone with a large family moving kids around to school, sporting events, etc. than a minivan. So why is the new Pacifica Hybrid my favorite? The biggest reason is Chryslers execution of their hybrid technology. The Pacifica starts off in electric-only mode for the first few feet or more depending on how hard you depress the accelerator. Depending on your daily driving situation you may use very little gas. Pacifica offers seating for seven or eight and is available in six trim levels: L, LX, Touring, Touring-L, Touring-L Plus, and Limited. Gasoline powered Pacificas are powered by a 287-horsepower 3.6-liter V6 paired with a 9-speed automatic transmission. The Pacifica Hybrid uses the same 3.6 V6 mated to a dual-motor electrically variable transmission. Some of the creature comforts available on a Pacifica include a Stow ‘n Vac integrated vacuum system; tri-pane panoramic sunroof; hands-free power liftgate and power-sliding side doors; and a dual-screen rear-seat entertainment system with wireless headphones, remotes, and aux/USB/HDMI input jacks. The Pacifica is EPA-rated at 18 mpg city/28 mpg highway/22 mpg combined. The Pacifica Hybrid is rated at 32 mpg combined and 84 MPGe, with an estimated all-electric driving range of 33 miles. The Stow-n-Go feature on the 2018 Chrysler Pacifica makes the most of the cargo area by allowing the rear seats to fold away into the storage area. Watch the video below to see how easy the Stow-n-Go seating system is to use. Q. Does the Chrysler Pacifica come with all-wheel-drive (AWD)? A. No, currently the Chrysler Pacifica is not available with all-wheel-drive. It is front wheel drive only. Q. Can the Chrysler Pacifica tow (including the hybrid)? A. The maximum towing capacity for the Chrysler Pacifica gasoline models is 3,600 pounds. Chrysler does not recommend towing with the Pacifica hybrid. Q. What is the seating capacity of the Pacifica? A. Depending on which trim level you choose the seating capacity is either 7 passengers or 8 passengers. Q. Does the Pacifica come with a remote start feature? A. Yes. Starting with the Pacifica L trim level you get the wonderful remote start feature. Q. What is the MPG of the Chrysler Pacifica hybrid? A. The Pacifica is EPA-rated at 18 mpg city/28 mpg highway/22 mpg combined. The Pacifica Hybrid is rated at 32 mpg combined and 84 MPGe, with an estimated all-electric driving range of 33 miles. 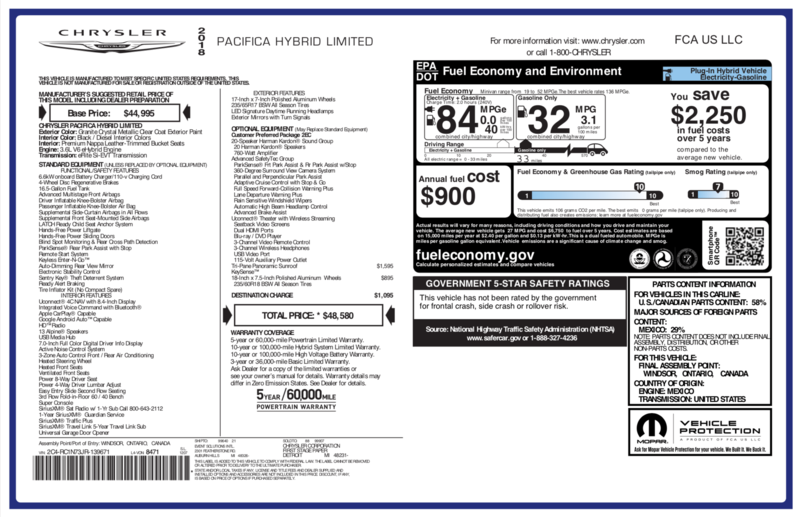 Window sticker for the 2018 Chrysler Pacifica Minivan with eHybrid drive and Limited trim.